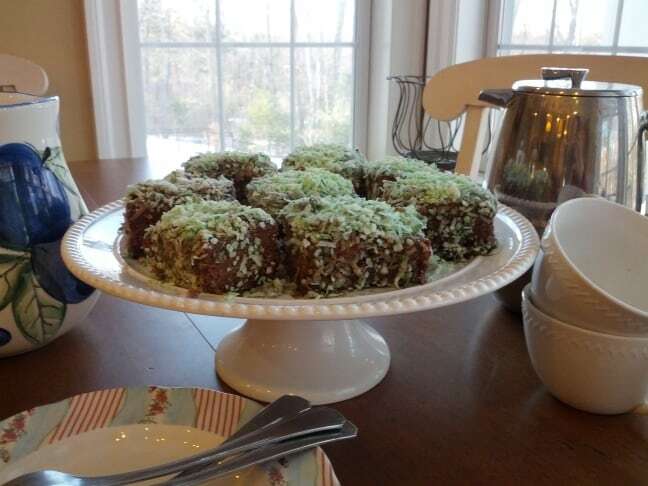 I have to admit, I am a lover of Lamingtons! As some of you know my husband is an Aussie and these delicious little cakes are a staple item in Australian bakeries. There is some history to them-they are named after a Lord Lamington, Governor of Queensland. One of his cooks came up with this recipe of a way of using up cake that had become dry due to the hot Australian heat. However, history aside all you really need to know is they are delicious! 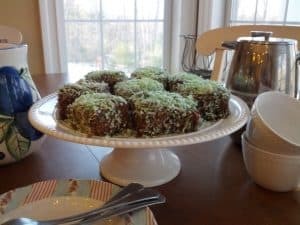 I have made these a few times for various classroom parties (when treats were actually allowed) and it was always followed with multiple emails with requests for the recipe. As good as they are, they are so simple to make! They are messy (yet easy) to make. You will most likely have your hands coated in chocolate sauce and coconut. Its ok…they are worth it. 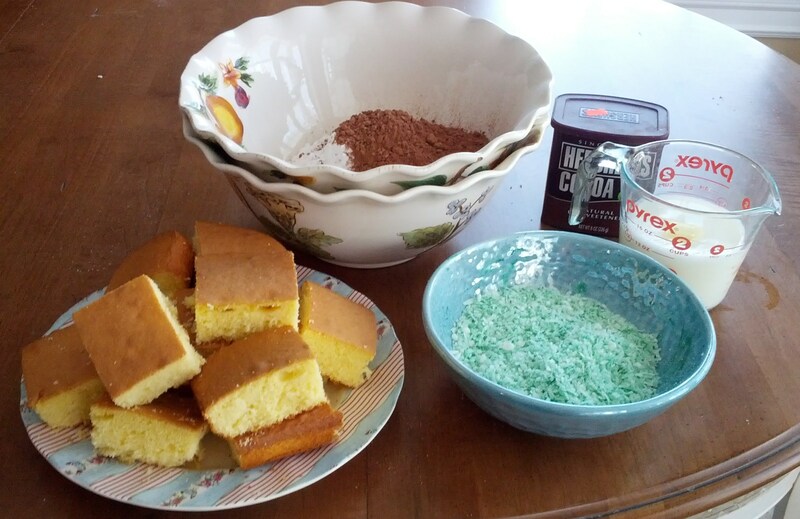 We used a box cake mix to make these quick and convenient (Trader Joe’s All Natural Vanilla) but you can make your own cake from scratch if you want or use your favorite mix. You might want to plan for some exercise earlier in the day as you may not be able to stop at one! 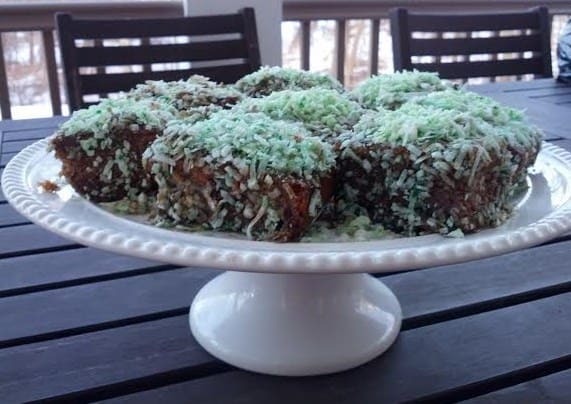 In Australia these are made with “desiccated coconut” which is shredded and dried out and finely ground. Its hard to find in the US so the shredded variety works just fine. Make the cake according to package instructions. Let cool completely and sit out for a few hours before assembling-do not cover. The cake will assemble better if it is exposed to air for a bit of time. Once cooled, cut into uniform size pieces (as best as you can…it does not need to be exact) and set aside. In large bowl, mix the sugar and cocoa. Add in the milk and butter and stir until smooth. Place coconut in bowl add a few drops of food coloring and mix in until the coconut is all green. Now its assembly time! Take each piece of cake and coat in cocoa mix (use tongs or fork) and then roll in the coconut so its completely covered on all sides. Repeat for each piece until done. If the cocoa mix starts to get too thick to work with, place the bowl in a slightly larger bowl with some hot water in the bottom to help thin it out. Place on a beautiful plate (or not) and watch them disappear!